John Shirley Ceramics: What A Great Year It Was! What a year this has been. As far as my own work goes probably one of the most exciting ever. 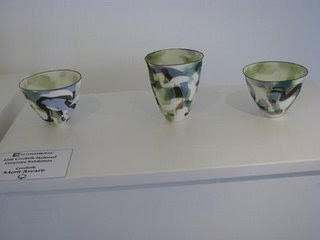 I continued with soluble salts on bone china and have had some good results as well as some great acknowledgement for this work. In the second half of this year I was fortunate enough to receive a merit award at the Corobrik National Ceramics Exhibition hosted by Ceramics S A. Peter Beard, renowned British ceramist, was the award judge for this exhibition. I also participated in the Staff exhibition at the University of Johannesburg, where I am currently a lecturer, as well as 'The Magic of Making' at the Sally Thompson Gallery in Melville, and 'Oppitafel' (0n the table) at Artspace in Rosebank. I also have an article published on my trials with soluble salts in the current issue of Ceramics Technical the excellent Australian ceramic journal.